Mega Beedrill in game: 95 Who? Important notice! 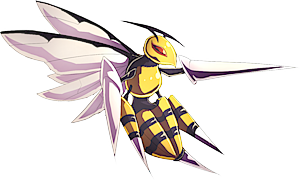 Pokemon Mega Beedrill is a fictional character of humans. 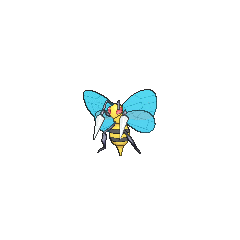 Beedrill (Japanese: ?? 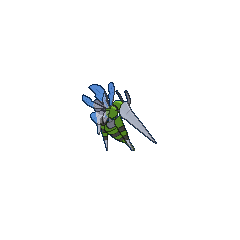 ?— Spear) is a dual-type Bug/Poison Pokémon. Beedrill is highly territorial and normally lives in colonies. As seen in the anime, Beedrill seems to be especially concerned with the welfare of Weedle and Kakuna, and it will respond aggressively to those that disturb them. Disturbing a swarm of Beedrill will cause the whole colony to attack. It flies at high speed and attacks using the large venomous stingers on its forelegs and abdomen. The two stingers on its forelimbs allow it to use its former signature move, Twineedle. It will take the victims of its attacks back to its nest for food. Beedrill nests in forests and misty wooded areas. Ash captured a Beedrill in the Bug-Catching Contest, but he gave it to Casey because she is a huge fan of yellow and black Pokémon. Multiple Beedrill also appeared in the same episode. Beedrill's first non-cameo appearance was in Challenge of the Samurai, where a swarm of them stole Ash's Metapod after evolving from Kakuna. The reason for this was to avenge Ash for failing to capture the Weedle (and startling it), which subsequently fled after Samurai arrived. The Beedrill reappeared in a flashback in Battle Aboard the St. Anne. 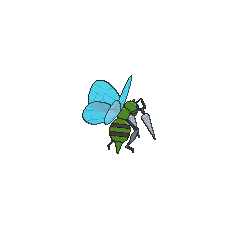 In The Fourth Round Rumble a Trainer named Jeanette Fisher used a Beedrill against Ash's Bulbasaur. It reappeared in a flashback in Friends to the End. In The Lost Lapras, an obnoxious Trainer who was attacking a Lapras had a Beedrill. Jimmy of New Bark Town owns a Beedrill which was seen in The Legend of Thunder! During Pokémon Ranger and the Temple of the Sea, Galen used two Beedrill to chase Ash and his friends. Multiple Beedrill appeared in Danger, Sweet as Honey!, evolving from a group of Kakuna. A swarm of Beedrill appeared in A Battle of Aerial Mobility!, chasing Ash, Clemont and Bonnie because Clemont's phonograph attracted the Poison Bee Pokémon instead of the Fletchling he was trying to attract. Another swarm of Beedrill appeared in A Jolting Switcheroo!, where they were chasing Lena and Dedenne, but they all were defeated by Pikachu and Dedenne. A Beedrill appeared in Foggy Pokémon Orienteering! when it was disturbed by Bonnie and Pikachu, who has been hit by a big twig on its head caused by Bonnie, but it quickly got away before Pikachu was about to attack it. Multiple Beedril appeared in Defending the Homeland! and Beyond the Rainbow!. They are one of Florges's minions who orders them to attack Goodra's homeland. Two of them appeared again in Facing the Needs of the Many! and then three of them appeared in the following episode. Three Beedrill appeared in A Windswept Encounter!. A Beedrill that can Mega Evolve appeared in Volcanion and the Mechanical Marvel, under the control of Dohga and Ether's Mega Wave. 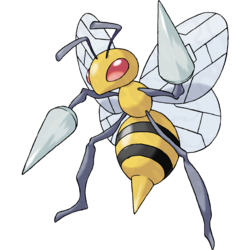 Beedrill has appeared in a lot of episodes, mostly having an antagonistic role to Ash and his friends who are usually attacked by a swarm of Beedrill and end up running away. 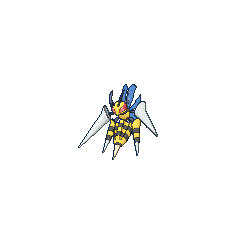 A Beedrill appeared in The Path to the Pokémon League under the ownership of A.J.. In a flashback of The Purr-fect Hero, Timmy was saved from a Beedrill by a Meowth. A Beedrill, under the ownership of an unnamed Trainer, appeared in a flashback in A Shipful of Shivers. A Beedrill appeared in Tracey Gets Bugged, where it blew Team Rocket's balloon. A Beedrill was seen in a fantasy in The Rivalry Revival. A Beedrill appeared in Illusion Confusion! as an illusion created by Haunter and Gengar. Multiple Beedrill appeared in For Crying Out Loud and Hot Matches! where they attacked Ash and his friends. Multiple Beedrill appeared in Mewtwo Returns, Celebi: Voice of the Forest, Pokémon Heroes: Latios & Latias and Destiny Deoxys. A swarm of Beedrill also appeared in A Better Pill to Swallow where they were attracted by the Shuckle juice that Team Rocket drank. Three Beedrill appeared in the same episode as part of Brock's fantasy. Multiple Beedrill attacked Ash's Bayleef in Turning Over A New Bayleef after she kicked a rock in the bush they were residing. Three Beedrill were among the inhabitants of an oasis just for Pokémon in Got Miltank?. 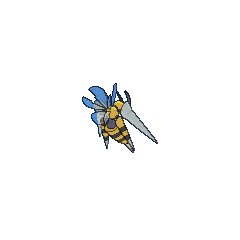 In Extreme Pokémon!, a Beedrill appeared with its Trainer, participating in the Extreme Pokémon Race. Multiple Beedrill appeared in A Poached Ego! where they attacked Team Rocket. A Beedrill was used by one of the students of the Pokémon Trainer's School in Gonna Rule The School!. A Beedrill is used in the PokéRinger Contest in That's Just Swellow. A Beedrill appeared in A Conspiracy to Conquer!, where it was mind controlled by an evil, psychopathic Malamar. A Beedrill that can Mega Evolve into Mega Beedrill appeared in Mega Evolution Special II. A Beedrill appeared in SM003, as a silhouette. BW124 Beedrill Ash's Pokédex Beedrill, the Poison Bee Pokémon. 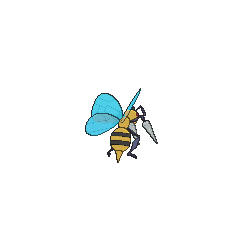 Beedrill fly quickly and attack using poison stingers on their fore legs and tail. 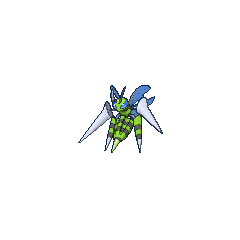 A Beedrill appeared as a silhouette when Green explained about Mew in The Jynx Jinx. 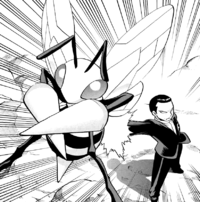 Giovanni owns a Beedrill that first appeared at the Viridian Gym in Golly, Golem! and Long Live the Nidoqueen! ?, fighting against Red. Giovanni has stated that it is one of his most treasured and strongest team members as he caught in his childhood at the Viridian Forest. Beedrill later helped Yellow when facing Lance at Cerise Island. It is also one of the few members of Giovanni's team that isn't a Ground-type. In PAORAS20, Beedrill was revealed to be able to Mega Evolve into Mega Beedrill. Spear refers to its stingers. In addition, the reverse of ?? ?— is ??? Apis (the genus for the honey bee).